I like it when I can combine high-quality with quick and easy. It’s certainly not always possible, but when you live your life “on the go” as so many people do these days, it’s great to have a few “quick and easy” recipes up your sleeve. It can really make the difference between keeping to your diet, and falling off the wagon. And perhaps bouncing once or twice as you hit the ground! Today’s meal is just exactly that kind of combination, the quick and easy mixed up nicely with high quality! Put the shrimp in one pan, with 2 tablespoons of coconut oil, and turn the heat to high. These can cook at the same time, but I’ll discuss the shrimp first. Cooking the shrimp could not be easier! Leave it cooking on high for about 10 minutes, then stir it thoroughly, then leave it cooking until all the water has boiled off. As soon as all the water boils off, the shrimp is done. The whole process shouldn’t take more than 25 minutes, and more likely will be complete at around 20 minutes. While the shrimp is cooking, put the sliced stir-fry veggies in a pan with 2 tablespoons of coconut oil and turn the heat to high. I really like the “Home Fry” shape of veggies, so I try to make my slices pretty long, somewhere around 2.5-3 inches in length, about 1 inch wide, and about 1/2 inch thick. The shape will contribute to the presentation of the dish, as you can see in the picture above – and more importantly longer slices saves on prep time! Faster, easier, and looks better? Sounds great! As soon as the stir-fry pan starts to sizzle, cover it and turn down the heat to about medium, or 5 out of 10. You want it covered because the liquid in the vegetables will start to steam the veggies, speeding up the cooking process, and helping to soften them. While the stir fry is cooking, dice the ginger, and get ready to add it, with the spices, to the stir fry. It’s the perfect time to prepare the ginger. If you like, you can add all these same spices to the shrimp as well – they’ll taste great! After about 5 minutes of cooking covered, stir the stir-fry, then add the ginger and spices on top. Continue to cook this covered, stirring every 1-2 minutes. The ginger and spices will really seep in to the stir fry as long as there’s still some water in the pan from the veggies – it’s a delicious effect! As soon as the shrimp is done, the stir-fry will be done too. These should be served together on a dish. You can toss them together in the same pan first, or serve them separately – either way is delicious! And enjoy! For more “What’s For Breakfast?” and “What’s For Dinner?” posts, check back daily! If you have any requests, comments, suggestions, questions or complaints, please jump in on the comments board! Why do you insist on making me hungry? LOL..I eat like a horse everyday as it is and you have a knack for making my mouth water! Yes! Score! I do the very best that I can do – hoping that each and every one of my readers is hungry when they’re done reading! Thanks for the comment Carl! I love shrimp! I am totally going to try this recipe. Would you like to guest post on my blog? Would love to share a paleo recipe there. My wife and I have really been loving our Shrimp lately! We get this wild-caught frozen shrimp from Trader Joes for a surprisingly good price, considering it’s wild-caught shrimp (9/lb)! We’ve been eating it in all sorts of different ways – just cooked in coconut oil (as this post was), coconut oil with black pepper, coconut butter with various seasoning (the butter is thicker, and sticks to the shrimp making it even more savory and delicious! )… We’ve really been going crazy with it, when it’s available. Really? That would be wonderful! Let’s definitely do that – I’ll email/Facebook you and we can figure out the details! This looks delicious. I’ve fried fish and prawns a couple of times in coconut oil but my husband hates it… so I’ve switched back to olive oil. I’ve just read your comment above re seasonings etc – maybe I need to add more seasoning rather than just herbs with salt and pepper. I love the nutritional qualities…. 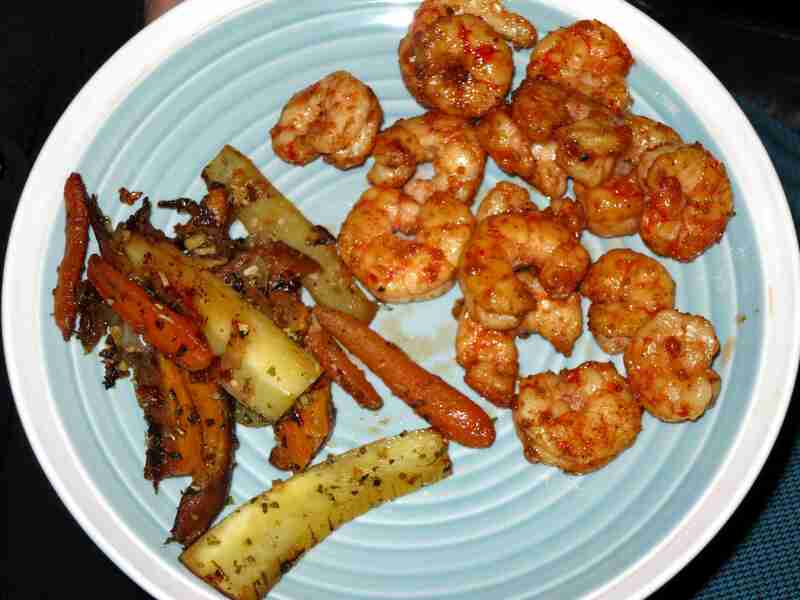 I need to try this shrimp recipe (love the look of the parsnips, sweet potatoes and carrots also). I love using coconut oil for everything! And to add to that: I think that the flavor of the spices I use are really enhanced by coconut oil. I only use olive oil cold now, and coconut oil when I’m cooking hot. The seasoning can be an important part. I find that cooked shrimp/prawns are amazing with some pepper and turmeric. And a few other great flavors can really enhance their flavor too (rosemary, oregano, etc)! Hm, do the nutrients in olive oil get affected by the heat? I love the fact that coconut oil can be heated to really high temperatures for frying. Thanks for the seasoning tips! Yes, olive oil has an oxidation temperature of about 170 degrees, which is not anywhere near the pan surface temperature for most cooking. So, while olive oil is better than corn oil or soy oil (which are bad at any temperature), you’re still better off using coconut oil, or a nut oil like walnut oil for your cooking. I save the hazlenut oil for salads! But walnut and almond oil are both pretty good for cooking with if coconut doesn’t work. Also, there is a very noticeable difference in flavor between extra virgin coconut oil and just coconut oil. I have and use both, but they are very very different. Hm, good to know! I have extra virgin coconut oil and two types of coconut butter (one with cacao and agave added. So good!!). Haven’t tried normal coconut oil but I imagine that it’d be less ‘coconutty’? I love all nut oils. I’m using quite a bit of macadamia nut oil at the moment (which is readily available here, since it’s an Aussie nut) but have some wonderful walnut oil that I use for salad dressings. Never tried almond but will look out for it (weirdly enough, I use almond oil for my hair, entitled ‘sweet almond oil’. No idea if that’s the same as the cooking version?!). Is the coconut butter with cocoa the Artisana coconut butter? I have it, and it’s freakin’ amazing!!! Yes, the non-virgin coconut oil is definitely less “coconut” flavored; it also has a distinct “burnt” flavor, which is quite a nice flavor in the right circumstances. I do not suggest using it raw, since it has an aftertaste which I find is not easy to take, but that “burnt” flavor translates really well when cooking! I am SO jealous that you have mac nut oil! It’s rare and expensive for us here in the US. I think almost any nut oil has a higher oxidation temperature than the fruit oils, like olive oil or avocado oil, which are best used raw. Also, I just did some research on Mac Nut oil, and it looks like it’s nearly as good for cooking as coconut oil. Mac Nut oil only has about 1% PUFA, so there is very little probability of oxidation during normal cooking (deep frying is different…). If that’s your cooking oil of choice, it looks like it’s a great alternative to coconut oil. And if I had it as available as you do, I’d likely use it more often as well. Though, I would probably use slightly more coconut oil. I use coconut oil for my hair as a “pre-conditioner” for about an hour before my showers. I LOVE how well my scalp has recovered from it’s previously over-sensitive state from all the chemicals in most shampoos and conditioners. I credit the coconut oil for that! I have changed my shampoo and body soap as well, which I am sure helps. But the coconut oil is the biggest difference for me. Thanks for doing the research on the mac nut oil. Ah, I did guess that it was probably expensive in the US… I should send you a supply! Over here it’s reasonably affordable. I love it, both in terms of cooking quality and flavour. Shoot – Mac Nuts are the most expensive thing I buy here! They’re more expensive than fresh salmon, and worth every penny! !